David de Gea is regarded as the best goal keeper in the World but he might not have started his career when he did if not for Emilio Alvarez; Manchester United’s goal keeping coach. The two began to work together when they were in Spain and they both return to their homeland take on the Spanish giants; Barcelona including Messi in a crucial Champions League clash. 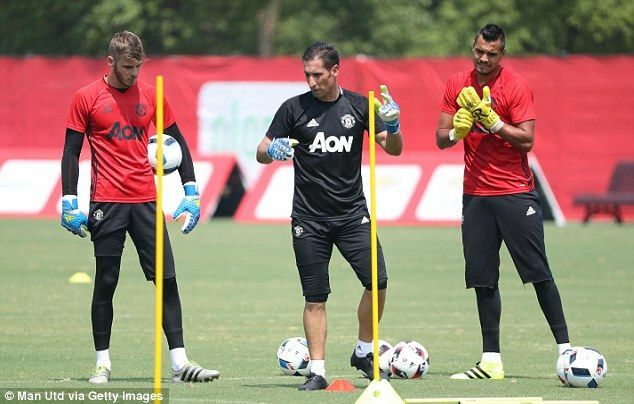 The former goalkeeper was a coach at Atletico Madrid and helped De Gea get his first team debut when he was only 17. In an interview with El Pais, he lifted the lid on his relationship with the Manchester United goalkeeper and the reason he stayed behind when Jose Mourinho was sacked last year. After establishing himself as a good goalkeeper in Spain, De Gea joined Manchester United as long term replacement for Edwin Van Der Sar in 2011 when he was only 19 years of age. The United goalkeeper’s Old Trafford career could have ended amid persistent interest from Real Madrid up until last summer, but Alvarez was a key reason in de Gea staying put. De Gea had a difficult start to Premier League life, he struggled with aerial balls and was easily bullied when engaging in duels with bigger players. The physicality of English football caused the slightly-built goalkeeper considerable difficulty. However, he went on to become one of the world’s best goalkeepers in the coming years, with his performances improving still once his working relationship with Alvarez resumed two-and-a-half years ago. Alvarez believes de Gea’s greatest strength is his mental resilience, which he believes is key in the Premier League. This will also help him take on Lionel Messi and his Barcelona mates. “This competition has a lot of nuances which make it different from any other,” he explained. “The style of play, the fast transitions and the refereeing criteria are different. Alvarez was retained on United’s coaching staff when Solskjaer took over from Mourinho in December when the former Benfica goalkeeping coach had expected to leave the club. He is known to be popular in United’s first-team squad – particularly among the Spanish contingent – and is well-respected in coaching circles. “I found it hard to understand why we were wasting time because we couldn’t do much. But I planned out drills and, because of my love for football, it happened.” Emilio came over to Manchester United on De Gea’s recommendation as he prefered to work with the former Atletico Madrid coach because of their relationship. David De Gea will be relishing the prospect of stopping Barcelona including the incredible Lionel Messi as Manchester United need a win to play in the Champions League semi-final. If they qualify, it will be the first Champions League semi-final that the Spain Number 1 would feature in.